Ghosts. Do you Believe?Sophie Rhodes doesn’t have a choice. She’s surrounded by them.Desperate to pay the bills, 29-year-old Sophie ignores the advice of her stuffy spirit-friend, Marmaduke Dodsworth, and takes a job with the handsome Dr. Callahan, an optometrist with a desperate situation of his own. The good doctor’s problem? He has a spirit-friend as well: one with a fiery crush and a vicious jealous streak. When chemistry starts to brew between Sophie and Dr. Callahan, his green-eyed ghost wreaks some bad-tempered havoc, scaring away his patients and putting Sophie on edge. 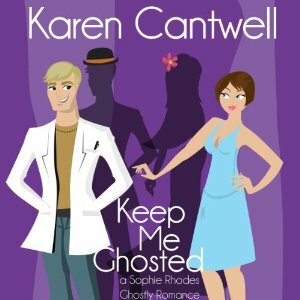 Will Sophie give up the ghost and quit the new job, or buck up and find a way to rid Dr. Callahan of his pesky specter, freeing their romance to find a life of its own? Keep Me Ghosted is a cute, fun romance, but perhaps not quite as cute and fun as I would have hoped. Sophie needs a job and finds one as Dr. Callahan receptionist/office manager. Sophie also has a ghost for a friend, a British bloke from the 1900 named Marmaduke. As luck (or a paranormal mystery/romance) would have it, Dr. Callahan also has a ghost friend, a very jealous young woman who says her name is Moonflower. She does not like Sophie, or other females in general, and makes sure everyone knows it. The romance is more on the sweet side than the steamy, although Sophie and Cal are a good couple. They’re both a little quirky, but enjoy each other’s company. Of course, as Moonflower gets more and more destructive, they need to find a way to get rid of her before she destroys their blossoming romance or, even worse, Cal’s business. I don’t know, I guess I didn’t buy that they were “meant to be together.” I feel like Sophie’s a little flaky for him. She means well, but a couple of her decision are more than iffy. And I think she falls in love in like a day and a half, but in her defense Cal might just be perfect – handsome, caring, donates to charity, works as a vision therapist. The ghost bits were a good addition. Marmaduke is funny, he’s sarcastic and wordy. I really liked him and I’m glad Sophie stuck by him. I think I liked his relationship with Sophie more than the romance with Cal. The paranormal peak was a bit odd, didn’t necessarily fit with the slow build up. There was also a scene near the end that I personally didn’t like, even though I guess it fit with the overall spirit of the story. Nan McNamara did a good job as the narrator. She captured Sophie’s voice well. Sophie’s almost 30, but acts younger a lot of the time, and Nan gets the tone right. She portrays her humor well and her swooning around Cal. I got tired of the mooning over the guy, but that’s not the reader’s fault. She also succeeded in reading the other characters in a way that set them apart and made them recognizable. It was a good one to listen to, light and funny but not so absorbing that I forgot what was going on around me. Enjoyable enough, but I’m not going to remember it in a month. That’s about what I’d expect from that book. It sounds good for a busy time. And it was a nice break from all the mysteries I’ve been reading lately. It does look like a good read when you need something light. Exactly, it’s what you expect.